“The Five Thieves of Happiness” sheds light on how combating internal “thieves” will leave behind a tough 2016 and make a difference for society in 2017. Almost all the misery of the world is wrought by unhappy people who bring their pain onto others in various forms of violence and oppression. It's no doubt 2016 was a tough year for most. A U.S. presidential election divided our nation. Military conflicts and financial hardships created pain throughout the world. Many are starting the new year feeling powerless in how to make 2017 better. But a newly released book reveals how individuals can look internally to make with themselves happier, which then will start a positive chain-reaction. “Almost all the misery of the world is wrought by unhappy people who bring their pain onto others in various forms of violence and oppression. If the inner life is good, the outer manifestation is good,” explained John Izzo, whose latest book, "The Five Thieves of Happiness," is available on Amazon in paperback. 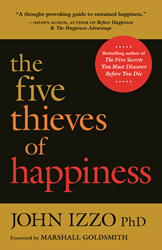 Izzo’s "The Five Thieves of Happiness" identifies five “thieves,” or mental patterns, that rob internal happiness. Drawing on research in psychology, the spiritual traditions and the author’s personal journey to discover sustainable happiness, this is the latest work from the bestselling author of "The Five Secrets You Must Discover Before You Die." According to Izzo, happiness is the natural state for human beings and harmony is the natural state for humanity. But the way people think often robs their personal happiness. Izzo believes that the same thieves that steal personal happiness are also harming societal harmony. Izzo, a bestselling author and world-renowned business consultant and researcher, uncovered the five thieves as he sought the true source of happiness during a year-long sabbatical, walking the Camino de Santiago in Spain and living in the Andes of Peru. The five thieves are control, conceit, coveting, consumption, and comfort. Izzo’s book outlines these mental patterns and offers practical ways to combat them on a daily basis—e.g., serving others combats conceit and expressing gratitude combats coveting. Izzo, a pioneer in the environmental sustainability movement who has advised more than 500 companies in workplace trends and sustainability, believes that the same mental thought patterns are getting in the way of humanity’s progress. Conceit keeps people destroying nature and focused on their tribe/nation, comfort keeps humanity locked in patterns that no longer work, control causes people to try to dismiss ideas different than their own, and coveting allows people to blame others for their misfortune. “Most of us are waiting for happiness to be given to us from the ‘outside.' John shows us how to find it on the 'inside.' I hope this book helps you as much as it helped me.” — Marshall Goldsmith, Bestselling Author of "What Got You Here Won't Get You There"
For more information, visit drjohnizzo.com/five-thieves-happiness. "The Five Thieves of Happiness"
John Izzo is the bestselling author of six books including the international best seller "The Five Secrets You Must Discover Before You Die" which was the basis of a public television series, He has advised over 500 companies across the globe on creating high engagement, purpose-driven workplaces. He has personally spoken to over one million people and his work has been featured by the likes of Fast Company, Investor’s Business Daily, CNN, Inc. Magazine, and the Wall Street Journal. He has been a pioneer in understanding the future of workplace trends and what companies must do to succeed in the rapidly shifting world of new expectations. Twice in his career he was a pioneer, both in employee engagement and corporate social responsibility ("Awakening Corporate Soul," 1994) and changing employee values ("Values Shift," 2002/2005). His next book, "Purpose Revolution," will be released later this year. As John Izzo traveled the world for four decades, the vast majority of human beings he encountered in many diverse cultures across six continents seemed to be good and decent people. Why then was the evening news filled with unimaginable horrors, and why were we running like buffalo off a cliff toward environmental catastrophe, when it seemed so obvious that change was needed? Maybe the same thieves who were stealing our personal happiness were also robbing our societal harmony. After all, what was society but an outgrowth of each of our inner worlds write large. This is why all global or community change must begin in the heart of each of us. Over the last twenty years, Izzo has worked tirelessly to create a more sustainable world including extensive volunteer work in East Africa and leadership positions in the sustainability movement. He was Chair of the North American Environment Caucus at the U.N. Conference on Population and Sustainable Development in Cairo, the chair of the Canadian Parks and Wilderness Society, and Conservation Chair for the Sierra Club in California. He is a distinguished fellow at the East-West Institute, a New York based think-tank, dedicated to creating a more peaceful and sustainable future.